In Romans 12 Paul is obviously drawing upon the Sermon on the Mount as he calls Christians in Rome to bless those who persecute them, to refuse retaliation, to act charitably toward enemies, and to overcome evil with good. In Romans 12 Paul is speaking directly to the believers in Rome, using the pronoun “you.” But when Paul talks about Caesar in Romans 13 the pronoun changes to “he.” To put it crudely, Romans 13 isn’t about you. Romans 12 is about you! Regardless of what Caesar might do with the sword of vengeance, and however we might envision God accomplishing sovereign purposes through a pagan government, followers of Jesus are called to renounce revenge and love their enemies. Always. This is the Jesus way. What Paul is doing in Romans 13 is calling Christians living in the Roman Empire to obey civil laws and not be drawn into violent revolutionary movements. Paul understands that the kingdom of Christ is never established by violence and the Roman Empire cannot be converted to Christ by violence. What Paul seems to be commending in Romans 13 is police function. The empire as night watchman. Though I can’t develop the argument fully here, I draw an important distinction between police function and the waging of war. And even though I realize that at times the line of distinction can be blurred, there really is an enormous difference between the two. There is a difference between the constable arresting a burglar and the bombing of Hiroshima! I’m not an anarchist. I view police function as necessary to maintain a civil society. But no matter what I think about it, it’s clear that Paul does not envision Christians possessing Caesar’s sword. From Paul’s perspective this was simply impossible. When Paul talks about the government in Romans 13, he is talking about a pagan government in rebellion to the Lordship of the resurrected and ascended Christ. But the pagan government still serves a useful purpose in maintaining a civil society. What Paul is not thinking is that he’s giving us a way to ignore Jesus and the Sermon on the Mount! If we had asked Paul, “Yeah, but what happens when the emperor becomes a Christian?” — I think Paul would have been incredulous, saying, “That could never happen.” But it did happen. Sort of. And that’s where the mess really begins — with a quasi-Christian emperor. 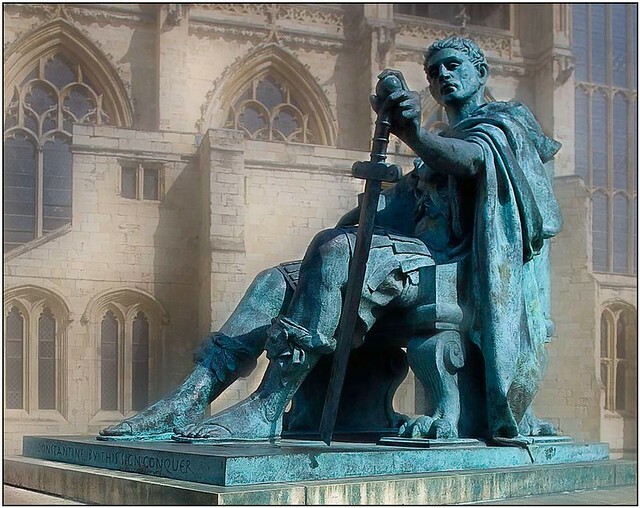 I say, “quasi-Christian,” because even Constantine himself apparently understood that he could not be a Christian and be emperor at the same time. Which is the most likely explanation for why he delayed being baptized for twenty-four years until he was on his deathbed. In any case, after Constantine Romans 13 does begin to be employed by theologians as a way to call Christians to support the various war efforts of their Christian kingdoms and nations. No, obviously something has gone wrong. Sure, the idea of government operated police function can be part of God’s purposes to maintain a civil society where criminals — whether they are pagans or Christians — are apprehended and punished. But when we reach the point where Romans 13 is used to teach German Christians that supporting Hitler is their Christian duty, we know that this interpretation of Romans 13 has gone off its Christian rails! So this is my question to American Christians who are fond of using Romans 13 to call for endless military buildup and waging what can only be an endless “war on terror.” Why are the American Revolutionaries of 1776 exempt from Romans 13? Is your use of Romans 13 to call for Christian support of American war-waging principled and consistent or is it self-serving and inconsistent? Are you using Romans 13 to help clarify how Christians should live as “exiles” within an empire, or are you using Romans 13 to endorse the militarism of your favorite empire? So, yes, Paul calls us to be “subject to the governing authorities.” But let’s not read into that more than we should. Jesus was subject to the governing authority of Pontius Pilate, but that doesn’t mean the Roman governor was acting justly! On Good Friday the Roman government wasn’t the servant of God — the Roman government was the servant of the satan! At his trial Jesus explained to Pilate that his kingdom was such that it forbade his followers to fight (see John 18:36). Jesus was subject to Rome in that he did not violently resist it — as Peter was so eager to do. But in being “subject to the governing authorities,” Jesus shamed the principalities and powers in his crucifixion and was vindicated by God in his resurrection. This is the posture toward evil that followers of Jesus are called to imitate. To pit Paul and Romans 13 against Jesus and the Sermon on the Mount is bad hermeneutics…and even worse Christianity.